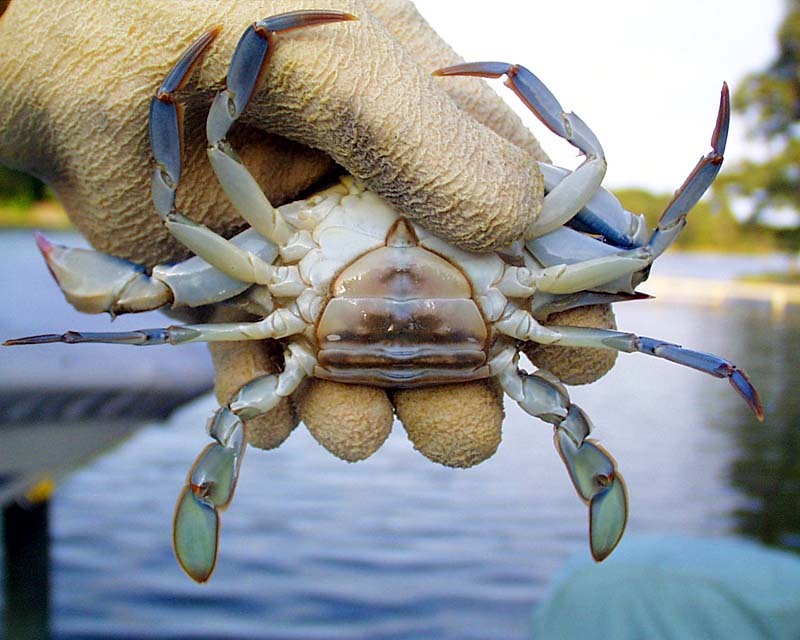 In addition to the claws, there are other (better) ways to determine the gender of a blue crab. But first, a little science. 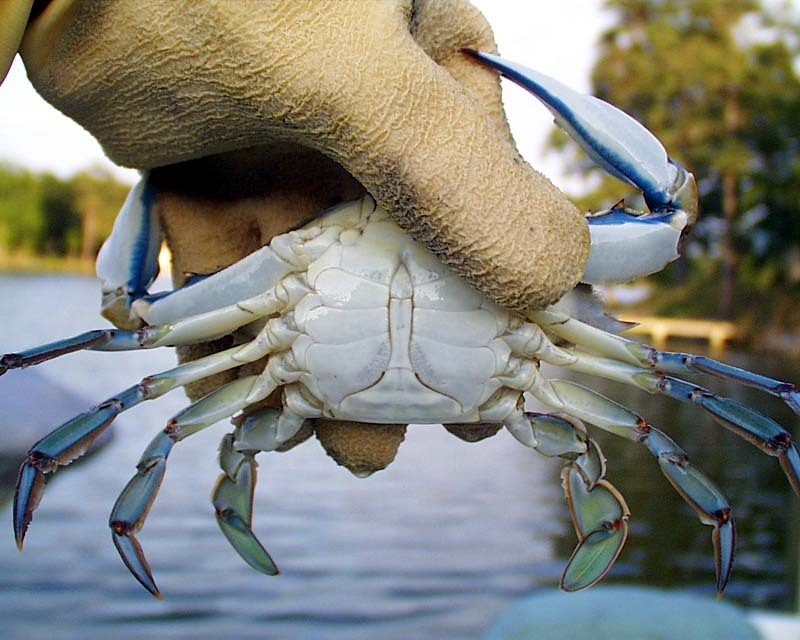 The Atlantic blue crab (Callinectes sapidus) is a member of the Brachyura - an order of crustaceans having a reduced abdomen, or "apron," folded against the ventral surface (or belly) of the animal. An easy way to think about this concept is to make a crab out of a lobster. You take a lobster, shorten up its tail and fold it up under its body between the legs, then press the tail up into its bottom shell until it's flush. Voilà! You now have a crab... well, sort of! This should help illustrate how a crab evolved to its current form. 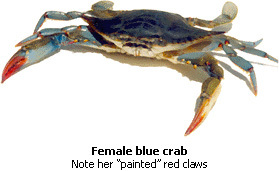 As you can see highlighted in red, the aprons allow you to quickly determine the gender and maturity of the blue crab. 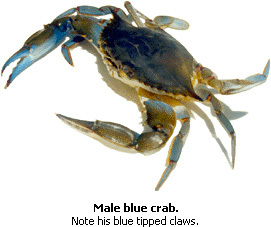 A male blue crab, known as a "Jimmy" to watermen, has a long, narrow, inverted "T" shaped apron and blue-tipped claws. 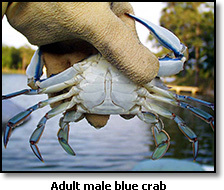 Unlike female blue crabs, there is no easy way to distinguish the sexual maturity of the male. However, upon close inspection, you will note that the apron of the adolescent male is tightly sealed to his body whereas the adult male is free to open his apron (like the mature female, the male opens his apron in order to mate.) The adult male has locking spines adjacent to the fifth thoracic segment which hold his apron shut. 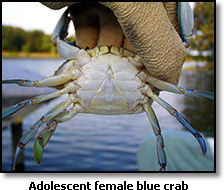 A immature (adolescent) female blue crab, known as a "Sally" or "She-Crab" to watermen, is easily identified as having an inverted "V" or triangular shaped apron and red-tipped claws. Her apron is tightly sealed to her body and does not open since she cannot mate or carry eggs. 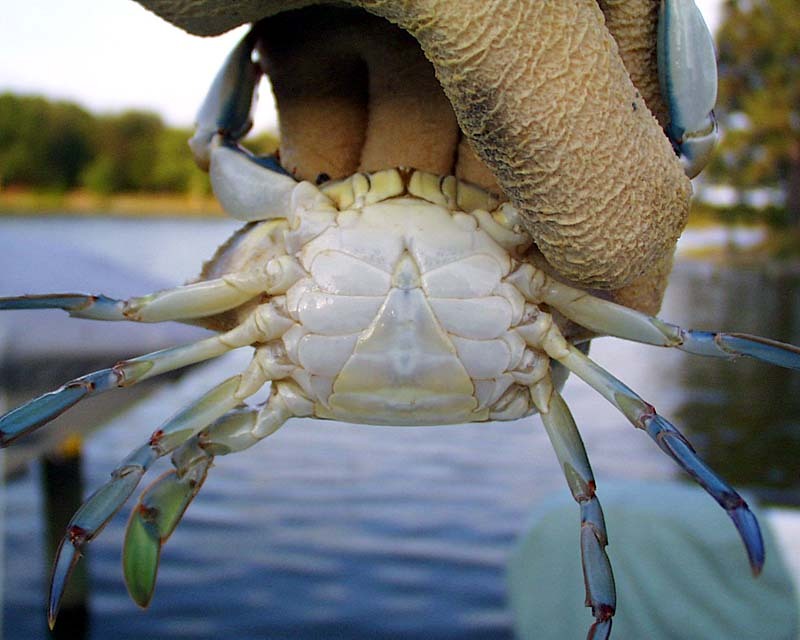 "Pregnant" female blue crabs carry fertilized eggs under their abdomen. From a distance these eggs resemble a sponge, hence the term "sponge" crab. It takes about two weeks for the eggs to "ripen" and be released into the water to hatch. 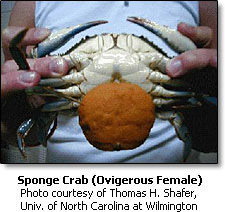 It is illegal in many states to possess sponge crabs. 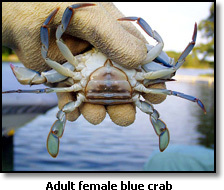 Please note that there is a lot of misinformation being circulated about the female blue crab and whether she has ever released eggs. Some people wrongly believe that sooks taken from the brackish waters of the mid to upper Chesapeake Bay have released eggs (spawned) and are therefore fair game. This is probably not true. When the female is about to become sexually mature, she molts and then mates with a male. During this mating, the male's sperm is transferred to special sacs inside the female for use at a later time... much later! Here's where we clear up the confusion: Mated, Yes. Spawned, No. There's a big difference between the two! After mating, and toward the end of the season, the "impregnated" sooks will migrate south toward the mouth of the Chesapeake Bay. It is here, in the high-salinity waters of the extreme lower Chesapeake Bay and Atlantic ocean, where she actually fertilizes her eggs and spawns. What does this mean in plain English? It means that the bulk of the sooks taken from Maryland and Virginia waters are females that have probably never released any eggs. Think about this fact the next time you take a sook from these waters. Please see Mating and Spawning for more detailed information.